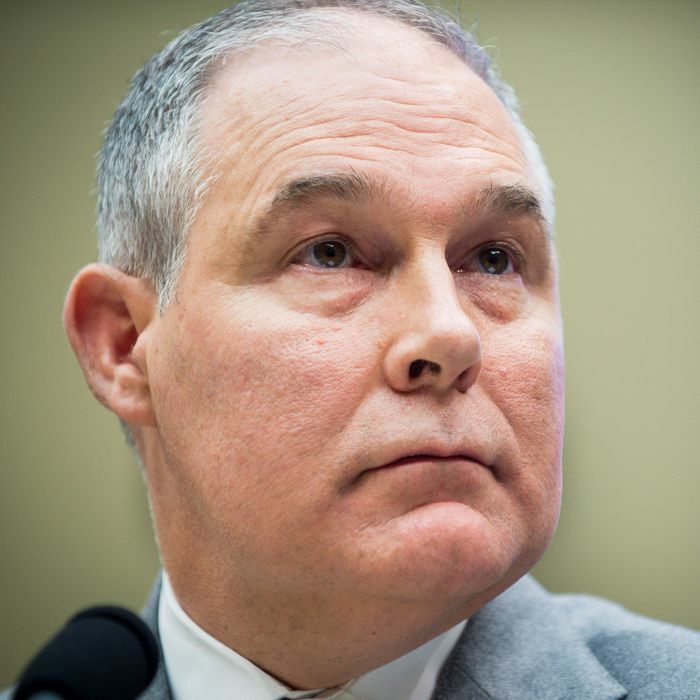 The head of the Environmental Protection Agency has broken months of silence about his frequent premium-class flights at taxpayer expense, saying he needs to fly first class because of unpleasant interactions with other travelers. Pruitt went on to explain to a New Hampshire reporter that a lack of civility in the friendly skies meant he needed beefed-up security (he is already the first EPA administrator with a 24-hour security detail that goes with him everywhere). This apparently means that he must enjoy the additional comfort and convenience of the first-class cabin. [I]t’s not clear what hazards, aside from those to your knees, lurk in the coach seats of the world’s most highly securitized public spaces. Nor is it evident how a first-class seat, separated from the proletariat by a gauze curtain, would help stop an assailant. Records obtained by the Environmental Integrity Project don’t show whether Pruitt’s security detail also flies first class. If they don’t, then you have to wonder why Pruitt feels safer separated from his guards. And the whole premise is a bit ridiculous: How many coach travelers on a random flight are going to board the plane ready to razz Scott Pruitt? I write about politics every day, and I wouldn’t recognize the man on a plane if he ran over my foot with his rolling suitcase. Scott Pruitt has been widely lampooned as a lackey for the fossil fuel industry, putting in lots of documented hard work to create that impression. Short of going about wearing an ExxonMobil windbreaker or appearing in one of those “We Are Koch” ads, it’s not clear Pruitt could do anything to reinforce his bad rep that’s more blatant than this plea for special treatment and isolation from the riffraff. Maybe he, and his boss, just don’t care about appearances anymore, so long as constituencies are being tended and “the base” doesn’t mind. But they should be careful: Your average MAGA fan most decidedly does not travel first class.